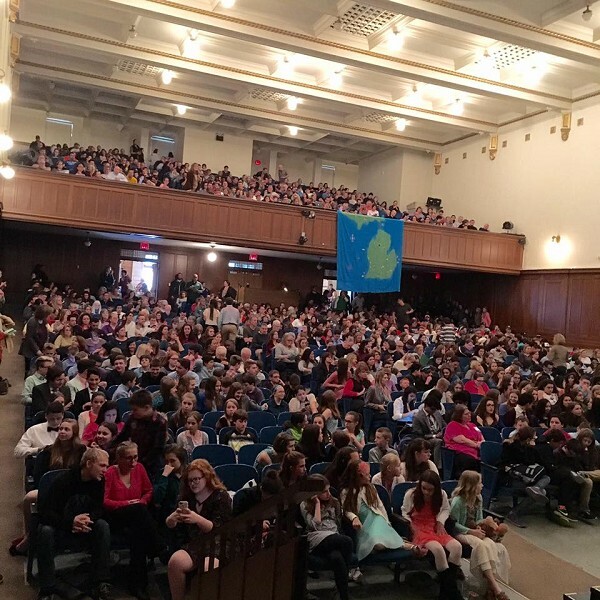 More than 1,000 students were packed into the Bay City Central High auditorium for Michigan History Day. Three local junior high students won top honors in a state history competition last Saturday at Central High. Delaney Wesolek, a student at Christa McAuliffe Middle School in Bangor Township, won "Best Entry in Michigan History," and Handy Middle School students Ellie Durussel and Victoria Wooley, were named national finalists at the State Finals competition of Michigan History Day on Saturday, April 30, at Bay City Central High School in Bay City. Miss Wesolek took "Best Entry in Michigan History, sponsored by Meijer, for her junior high individual exhibit, "The Making of the Michigan Timber Law: Order on the River." Ellie Durussel and Victoria Wooley, of Handy Middle School, were named national finalists for their junior division group website, "World War II War Brides." Bay City Central High students Seth Howell, Spencer Moulthrop, Jacob Pawlak and Elly Villeneuve were named a national alternate in the senior group website for their project entitled "Apollo 11: Mission to the Moon." Christopher Von Claparede, of the Saginaw Arts & Sciences Academy, won national alternate in the senior division for an individual paper entitled "Paris Exposition Universelle: When the World Stood Under the Eiffel." Charles Parsons, Midland High, was named a national finalist in the senior division individual website for "Bypass Odorizer: Stinky Sulfur Smell Saves Lives." He also received the James Campbell Award for best use of oral history from the Michigan Oral History Association. Nearly 500 Michigan elementary, middle and high school students -- a record-setting number -- took part in this year's Michigan History Day, which is an educational program of the Historical Society of Michigan. The finalists in the junior and senior divisions will now move on to the National History Day competition this June in College Park, Md. The state champions for Michigan History Day 2016 include students from Ada, Bay City, Berkley, Bloomfield Township, Brighton, Cassopolis, Cedarville, Detroit, Grand Rapids, Holland, Houghton, Kalamazoo, Madison Heights, Marshall, Midland, Muskegon, Newberry, Pickford, Portage, Richland, Saginaw, South Haven, Traverse City, Westland and Whitehall. "This year's theme -- Exploration, Encounter, Exchange in History -- challenged the students to really think outside the box," said Andrea Lorion, Michigan History Day state coordinator. "As a result, there are many outstanding and diverse entries in all five categories -- performances, exhibits, papers, websites, and documentaries. Michigan History Day (National History Day in Michigan) offers a fascinating opportunity to move beyond routine learning. Based on the annual theme, students choose to explore and research a local, national or international historical topic. They then present their work through the disciplines of writing, art, literature, music, drama and/or visual communications. 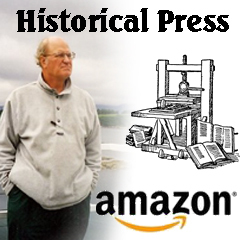 Lead sponsors of Michigan History Day 2016 include Meijer, the W.K. Kellogg Foundation, Amway and Bay City Public Schools.